Our hot water heater control panel is available with or without heat recovery. 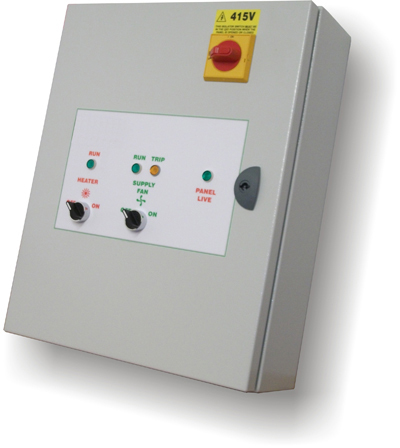 The control panels are built to order and are supplied with duct sensor and frost protection thermostat. It is designed to control a LPHW heating valve, supply and extract fans, and a face / bypass damper. The control panel is also designed to be wired into the buildings fire alarm circuit, this will shut the panel down in the case of a fire. The temperature is controlled by the SB37 control PCB, this monitors the supply air via a duct sensor fitted in the duct at least 2M from the heating coil). The heater can be switched on and off by the facia mounted heater switch and has an on lamp on the facia to show the heating is enabled. The damper is controlled by the same SB37 pcb, this monitors a second duct sensor which is positioned in the fresh air duct. Have a question about Sarum Hot Water Heating Control with Heat Recovery? Please fill out the form below and we will get back to you.